“Vivre Pour le Meilleur” – Johnny Hallyday | Marbella Marbella – Adelante! Hallyday, whose music career has spanned a half-century, is one of France’s biggest stars. He has completed 100 tours, had 18 platinum albums, and sold more than 100 million records. Following a farewell tour Hallyday announced his retirement from performing on 3 December 2007 at the age of 64. He was strongly influenced by the music of Elvis Presley and the 1950s rock revolution, Hallyday became famous in the 1960s for singing rock and roll in French. His debut single, “Laisse les filles” was released on the Vogue label in March 1960. His first album, Hello Johnny, was released in 1960. In 1961 his cover of “Let’s Twist Again” sold over one million copies, and was awarded a gold disc. It topped almost every European chart, although the track did not appear in the UK Singles Chart.He appeared on the American Ed Sullivan Show with American singing star Connie Francis in a show that was taped at the Moulin Rouge nightclub in Paris. He also staged many appearances in the Paris Olympia under the management of the late Bruno Coquatrix. For their first concert, The Jimi Hendrix Experience opened for Johnny Hallyday in Évreux on 13 October 1966. At the end of the 1960s, Hallyday made a string of albums with Mick Jones and Tommy Brown as musical directors, and Big Jim Sullivan, Bobby Graham and Jimmy Page as session musicians. These are Jeune Homme, Rivière… Ouvre ton Lit (aka Je suis né dans la rue) and Vie. On Je suis né dans la rue, Hallyday also hired both Peter Frampton and the Small Faces. Amongst their contributions are the songs “Amen (Bang Bang)”, “Reclamation (News Report)” and “Regarde Pour Moi (What You Will)” which are variations of Small Faces and Humble Pie – which was Frampton’s band – tracks and they can be heard playing on the album. Often forgotten is Hallyday’s non-LP single and EP track “Que Je T’aime” from the same sessions. By1969 alone, his sales of records exceeded twelve million. Many consider Hallyday to have developed well and become a greater performer in his later years, one of his concerts, 100% Johnny: Live à La Tour Eiffel in 2000, attracted an audience of 500,000 and 9.5 million television viewers (the show was broadcast live on French TV). 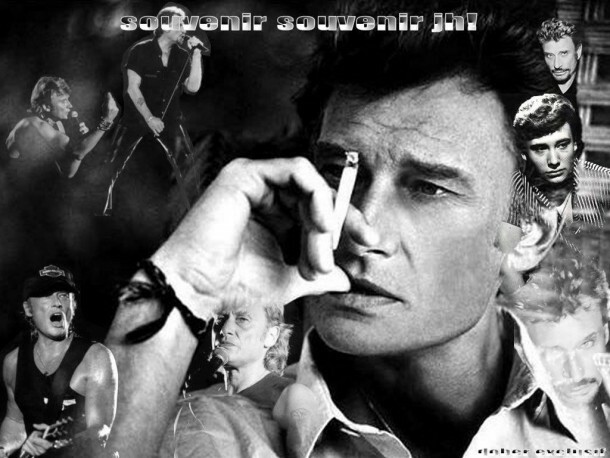 In December 2005, Hallyday had his third number-one single in France, “Mon Plus Beau Noël” (after “Tous ensemble” and “Marie”), dedicated to his adopted daughter Jade. Shortly before announcing his retirement from touring, he released a blues-flavored album, Le Cœur d’un homme, on 12 November 2007. The album hit in both France and French-speaking Belgium. In addition to the lead single “Always”, Le Cœur d’un homme features “T’aimer si mal”, a duet with bluesman Taj Mahal and “I Am the Blues”, an English-language song written for Hallyday by U2 frontman Bono. His next album, Ça ne finira jamais, released in 2008, another on the French album chart, and its lead single, “Ça n’finira jamais”, also reached In 2008 he recorded a series of acoustic songs with French musician Drexl Jonez. Hallyday’s most recent album, also a 1 hit in France, is Tour 66: Stade de France 2009, a live set recorded at Stade de France during his farewell tour with appearances by Drexl Jonez on the guitar. Hallyday remains largely unknown outside of France, thus earning the nickname “the biggest rock star you’ve never heard of” in English-speaking countries. He was made Chevalier (Knight) of the Légion d’honneur in 1997.